Bar-mounted. this display exhibits tight vertical placement. 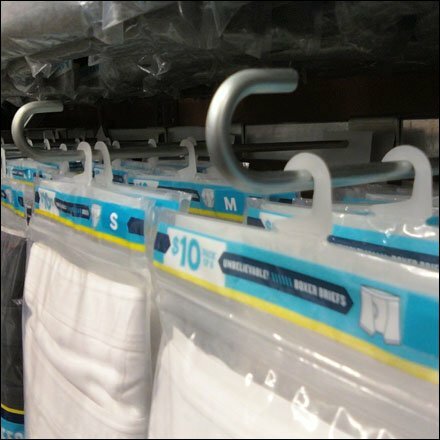 J-hooks provide positive product retention of even bulky softwoods. Normally this tight of placement of row with a J-hook tip would interfere with the removal of items. 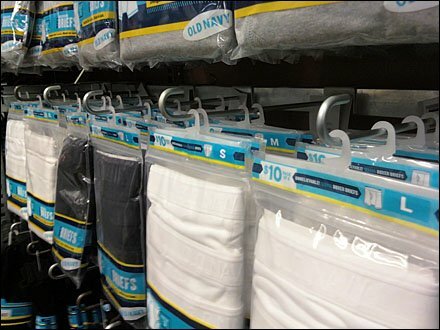 Here bags are themselves “hooked” rather than “holed” to allow easy access. CLICK thumbnail to zoom in for a better view of this slip-on Saddle-Mount Hook. SEARCH “Underwear” for other comparative posts.